All aluminum stair and metal work platform components are in-stock and ready to ship today! ErectaStep’s experience building metal stairs and metal work platforms goes back over 20 years. We’re leading the industry when it comes prefabricated metal stair kits as well as custom stair solutions that bolt together on location with no custom tools or equipment. 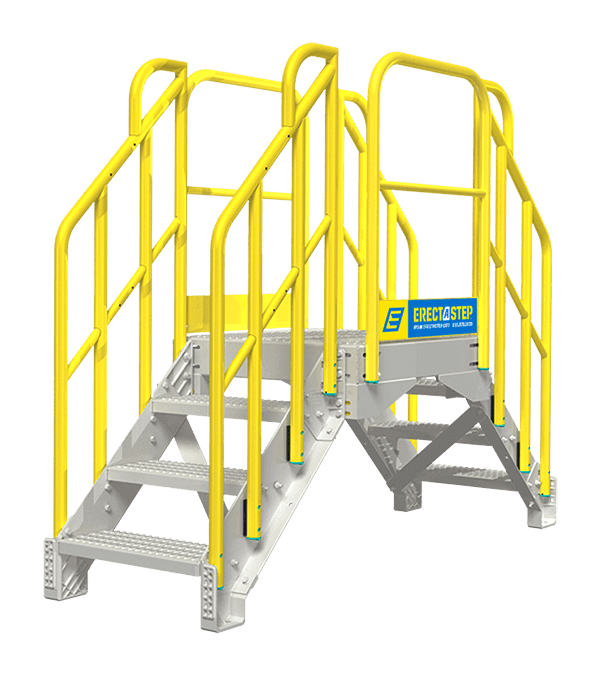 Improve safety and productivity with ErectaStep's OSHA & IBC compliant metal stairs, YellowGate’s safety gates and Rollastep’s rolling stairs & mobile platforms. Save time, money and eliminate custom fabrication with ready to ship metal stairs, metal work platforms, crossover stairs, and portable stairs. ErectaStep introduces four new metal stair solutions. The first is an all steel, bolt-together Commercial Stair kit. As well as two designer inspired Architectural Stair kits, a Spiral Stairs kit and a sleek Mono Stringer Stair series.